Sometimes, when reading a book that seems far distant from art at first blush, you get insights that are definitely thought-provoking. This happened to me as I was finishing a really interesting book, "The Spell of the Sensuous" by David Abram. It is a book which, to me, makes one think mostly about the extraordinary, damaging divorce between mankind and care of the planet in which we all live. Abram advances some very valid suggestions, tracing the original transformation in man's thinking about being an integral part of the natural world to the development of the alphabet and the gradual loss of oral traditions. However, it was in one of the notes that I found a comment about art that seemed to be worth pondering. I quote it, with thanks to the author: "Genuine art, we might say, is simply human creation that does not stifle the nonhuman element but, rather, allows whatever is Other in the materials to continue to live and breathe. Genuine artistry, in this sense, does not impose a wholly external form upon some ostensibly "inert" matter, but rather allows the form to emerge from the participation and reciprocity between the artist and his materials, whether these materials be stones, or pigments, or spoken words. Thus understood, art is really a cooperative endeavor, a work of co-creation in which the dynamism and power of earth-born materials is honored and respected. In return for this respect, these materials contribute their more-than-human resonances to human culture." I feel a little diffident about posting two drawings that I did in silverpoint which I feel were indeed groping towards the "Other", but in some sense, they were. One I drew because on the coast of Georgia, particularly on the barrier islands, there are thousands-year-old shell rings left by the Guale Indians where they came, year after year, to the coast to feast on nature's bounty in the marshes and salt water creeks. The Indians' presence is almost palpable, and in many ways, I feel we should do them honour as they were far better stewards of these lands than we seem to be in the 21st century. 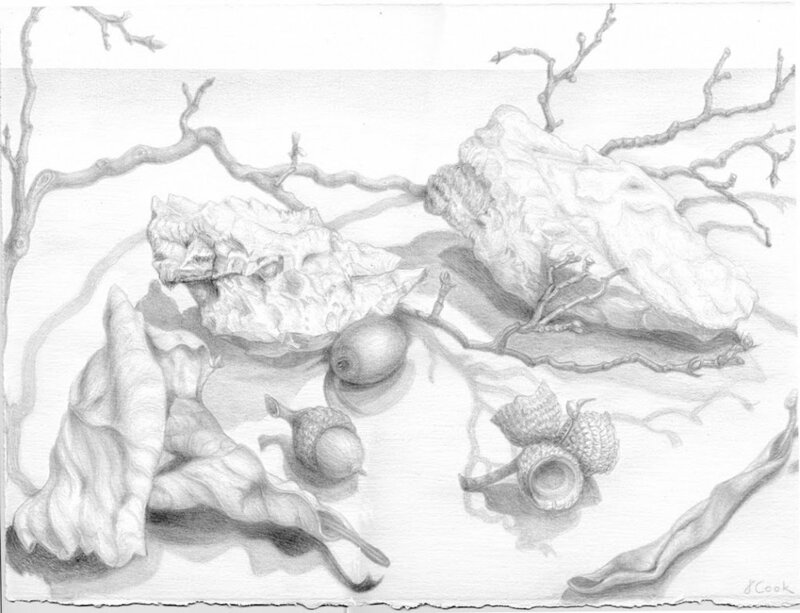 The other drawing is a meditation about the elements that are integral parts of the Blue Ridge Mountains, humble pieces perhaps, but each a vital link in that mountain ecosystem, and beautiful each in its own right. Looking at and communing with "earth-born materials" as I draw and paint bring peace and coherence, I find. I think David Abram is right in his observations.